MUCH ADO ABOUT STUFFING: Happy Thanksgivukkah! Hanukkah+Thanksgiving. How about Sweet Potato Latkes with Cranberry Chutney? Happy Thanksgivukkah! Hanukkah+Thanksgiving. How about Sweet Potato Latkes with Cranberry Chutney? 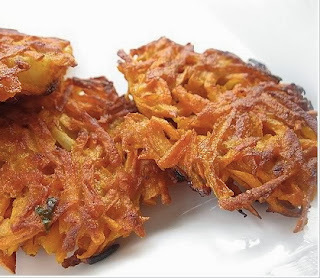 Here is the best recipe for latkes, you will just love them. just use 6 small sweet potatoes, and instead of the onion, use 3 shallots, and a quarter cup of fresh parsley. Using the shredding blade of a food processor, shred the potatoes. Set colander in the sink to drain. Squeezing out as much liquid as you can, put half the shredded potatoes in with the onions and eggs, and return the other half to the food processor with the steel blade, and pulse a few times. Heat about 2 1/2 inches of wesson oil in a large frying pan, and heat the oil till smoking. Drop a bit of the mixture in, it should sizzle like crazy. Serve with Creme Fraiche, Applesauce, and Gravlax. Wash the oranges well, cut off about 1/4 inch from both the stem and blossom end, and chop roughly in a food processor. In a large saucepan, combine the cranberries and water with 1/4 cup of Grand Marnier and bring to a simmer over moderate heat. Add the chopped oranges, cover and cook over moderately low heat, stirring occasionally, until the cranberries have popped, about 10 minutes. Add the vinegar, both sugars, the ginger and orange pieces and cook over moderate heat, stirring occasionally, until thick, about 5 minutes. Let cool slightly, then season with salt and pepper. Serve warm or at room temperature. Try mixing sriracha and sour cream for the tastiest fish-less latke topping!